This parish is run by a parish team of the Capuchin Franciscan Friars and the Sacred Heart Sisters. St. Francis of Assisi Parish, Priorswood, was established on the 15th of August 1974. It is located about five miles to the north- east of Dublin City Centre. It is quite close to Dublin Airport, which lies about a mile and a half from us. There are approximately 2,500 houses in the Parish and a population of 10,000. 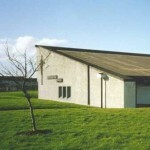 On the 3rd of February 1980, the New Church was dedicated by the then Archbishop of Dublin, Dr. Dermot Ryan DD.